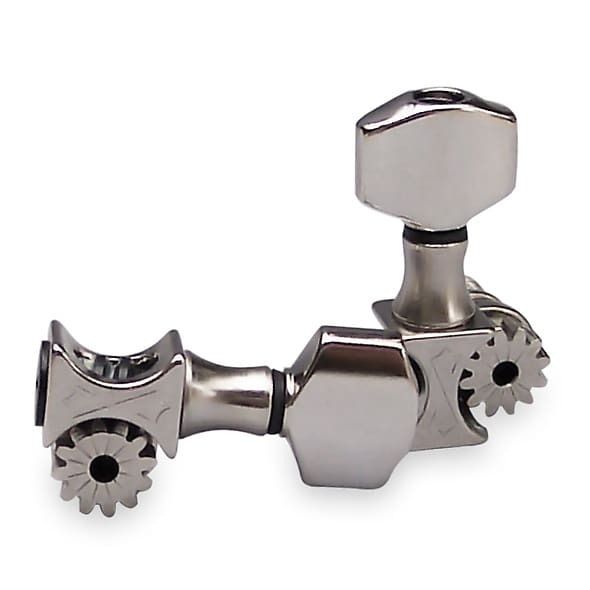 Sperzel Sound Lock tuning keys are machined from solid billet aluminum and designed to provide stable performance and reliable action. These light-weight, precise tuners don't require multiple string wraps and eliminate the age-old tuning problem of the strings seating during play. The housing on Sperzel tuners extends further up the shaft with the bushing threads on the outside, keeping the string post solid and eliminating wobble. Sperzel's unique design allows the tuners to be fully reversible, so they can easily be converted to left-hand, or to custom configurations. Restringing is quick and easy. The 6-in-line Sound Locks are height staggered, so you don't need a string tree. For 9/16" - 11/16" thick pegheads. Sperzel Sound Lok tuners require 10mm (13/32") diameter pegholes. 12:1 gear ratio. All tuners sold in sets of 6. Free shipping within the US on all orders of $75 or more!